Meanwhile lets just say that we are proud Robert Westbrook contributed a whooping 29 entries. Get our ebook Sermon Outlines for Busy Pastors: Colossians FREE! 9 complete expository sermons for preaching every verse in the book of Colossians. The Premier Bundle includes Volumes 1, 2, 3, 4, and 5. 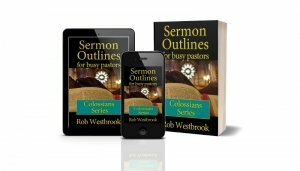 261 sermon outlines, including 17 multi-week sermon series.